Life On Mars star John Simm - who plays a detective involved in a near fatal car crash and wakes up in 1973 - has revealed he is lucky to be alive after walking free from a serious car accident. The actor was driving to watch his beloved football team Manchester United play Chelsea at Old Trafford, in Manchester, when he had the accident on the M1 motorway. He injured hurt his wrist and although sporting a heavily bandaged hand, says he is lucky that it was not fatal. Asked if he would be watching Manchester United in the Carling Cup semi-final against Derby County, he told BBC Radio Five yesterday: 'No not tonight, no chance. 'I was actually travelling up to see them play last week, the Man Utd versus Chelsea game last Sunday when I was involved in a car accident, so I never made it. 'It was on the M1 and that's why my hand is in this bandage. John, 38, played the role of Sam Tyler in the BBC smash hit show Life On Mars, who wakes up dazed and confused in the year 1973 after being involved in a car crash in 2006. 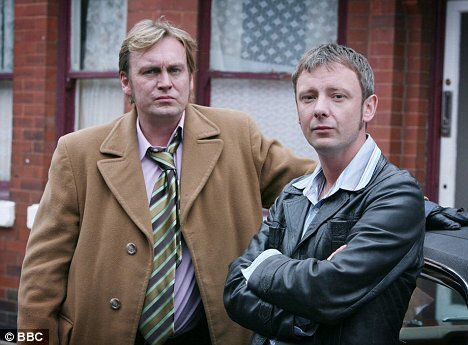 There he works as a Detective Inspector in the Greater Manchester Police force under Detective Chief Inspector Gene Hunt, played by Philip Glenister. Over the course of the series, Sam Tyler faces various culture clashes, most frequently regarding the differences between his modern approach to policing and the more traditional methods of his colleagues. It is unclear whether he is insane, in a coma, or if he really has travelled back in time. The programme proved a massive hit with viewers and scooped several awards, including two International Emmy Awards for Best Drama Series, Best New Programme category at the Broadcast Magazine awards. It won two categories, Best Drama Series and the Writers' Award, at the Broadcasting Press Guild Awards. The first series was nominated for a BAFTA in the Best Drama Series category. Simm was also nominated as Best Actor for his work on the show. The programme won the audience-voted Pioneer Award. And it was nominated as the Most Popular Drama at the 2007 National Television Awards. John married actress Kate Magowan in April 2004 and they have two children; Ryan, seven years and Molly, almost two years old. He is famed for his passionate support of Manchester United. Ich verlängere meine Liste von Dingen, von denen er sich fernhalten sollte um "Autos". Glück gehabt und gute Besserung, John! Sooooooo dringend braucht John auch wieder nicht einen Oscar, ehrlich....Lieber lebendig an einem Stück als oscar-gekrönt und tot. Puh, Glück gehabt würde ich sagen. Bin froh, dass das nochmal glimpflich ausgegangen ist. Zum Glück gehts ihm soweit gut. Wäre ja eine Horrornachricht,wenn er mags garnicht sagen.